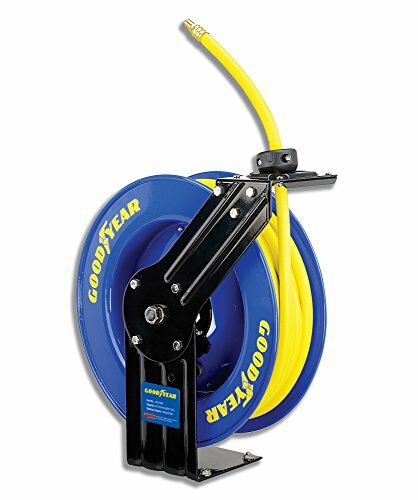 The Goodyear L815153G Steel Retractable Air Compressor/Water Hose Reel is manufactured using powder coated steel for strength and corrosion resistance. It can be mounted on a wall, ceiling or floor. The full flow solid swivel joint ensures smooth, uninterrupted fluid flow. The multi-position release ratchets spring fully enclosed. The hose is guided by four non-snag rollers that guide retraction and reduce abrasion and wear on the hose. DURABILITY/ EASY MOUNTING- The product has four directions non-snag rollers to reduce hose wear abrasion. And its base has four ½ inches drilled holes, ready to be mounted on wall, ceiling or floor. MULTI-FUNCTION HOSE - Product comes with a 3/8" x 50 ft. rubber hose, with max 300 PSI compatibility. It is suitable for compressed air and water usage. CORROSION RESISTANCE - Product crafted using powder coated steel for strength and corrosion resistance. PEACE OF MIND - Have peace of mind knowing that your order will arrive original factory sealed packaging. That means that you'll have the full force of the manufacturer's warranty to protect your purchase. On top of that, we get your order shipped out and delivered to your doorstep as quickly as possible. COMMITMENT- GreatCircleUSA is an authorized seller who is committed to providing customers with a stressful-free shopping experience. Buy with confidence; we are ALWAYS here to help. Manufacturer: Intradin China (Shanghai) Ltd. Publisher: Intradin China (Shanghai) Ltd. Studio: Intradin China (Shanghai) Ltd.